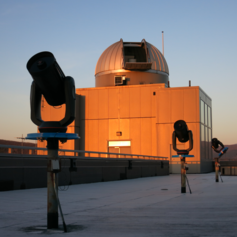 The Physics Department at Middlebury College will again host Open House nights at the College Observatory this spring. The Observatory, located atop McCardell Bicentennial Hall, will be open to the public for viewing the heavens on Friday evenings, April 29 and May 6, from 9:00 PM until 10:30 PM, provided the skies are mostly clear. Jupiter will be in the evening sky on both of these dates. Also visible through our telescopes will be a number of interesting stars, star clusters, and nebulae. There is no set program for the Open House nights; the public is invited at any time between 9:00 PM and 10:30 PM. The Observatory dome houses a 24-inch computer-controlled telescope. Additional, smaller telescopes will also be available on the roof deck for observing the night sky. All Observatory public nights are free and open to the public, but will take place only if the sky is at least mostly clear. If the weather appears uncertain, visitors may call the Observatory at 443-2266 or visit the Observatory web site after 7:00 PM on the evening of the Open House for a status report. More information can also be found at go/observatory . Also, please consider visiting the Observatory web site to sign up for our e-mail list with event announcements and status updates as well as to enjoy a wide variety of resources about astronomy at Middlebury and the night sky. The web site includes stunning images taken at the Observatory, information about what is currently visible in the night sky, history of the Observatory, and a summary of last year’s extensive Observatory upgrades. The Observatory would like to acknowledge support from the Michele and David Mittelman (’76) Family Foundation for enabling substantial renovations and modernizations that represent a fundamental commitment to the long-term future of the Observatory, both for curricular and research uses, as well as for outreach. These improvements to the Observatory are helping ensure that Middlebury students, College community members, schoolchildren, and the public will continue to be able to explore the universe on the Middlebury campus under dark Vermont skies.